Much to the frustrated, disbelieving horror of the Left, Ruth Bader Ginsburg is mortal, human, finite and due for retirement from the Supreme Court. That leads to the frustrated, disbelieving horror that someone younger and more Conservative might very possibly replace the ailing cheerleader-activist for international law and One World Government. 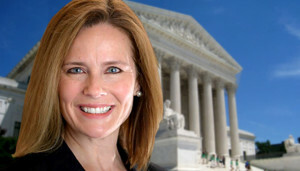 As the role of Supreme Court Justice is clearly defined as INTERPRETATION of the UNITED STATES Constitution, it might be refreshing to appoint a new member of the Court who respects and reveres (not longs to rewrite/discard) what is perhaps the greatest single document ever drafted in service to human freedom. That would be a welcome contrast to Prog icon Ginsburg on record grandly declaring inferior that hackneyed old thing drafted centuries ago back in Philadelphia by all those White slave owners; second rate as constitutions go. South Africa’s constitution, she has confidently opined, would be more her model for the new U.S. Constitution she’d love to write…that is, IF she (or anyone else) were in the business of re-writing the U.S. Constitution. Revamping the American blueprint is what the power-mad Master Planners, architects of American Transformation, multi-millionaire Marxists have in mind. They are not welcome here. That said, we are bracing ourselves graciously, optimistically for the next bit of “Resistance” madness surely in store for us as a new Supreme Court Justice is nominated, vetted and confirmed. Amy Coney Barrett appears to be at the top of Trump’s short list based on her legal experience, competence, sterling character and, not incidentally, her ability to withstand what has already been a grueling attack on her personal beliefs and character by the usual Leftist inquisitors in earlier confirmation hearings. Though somewhat prematurely, we bid an un-wistful farewell to RBG; and once she has outlived her usefulness as political propaganda, her grief-stricken fan base on the Left will swiftly move on to their next tantrum and accompanying shiny talisman of Marxian worship. What some people will do, over & over & over again, to avoid the agonies of freedom.